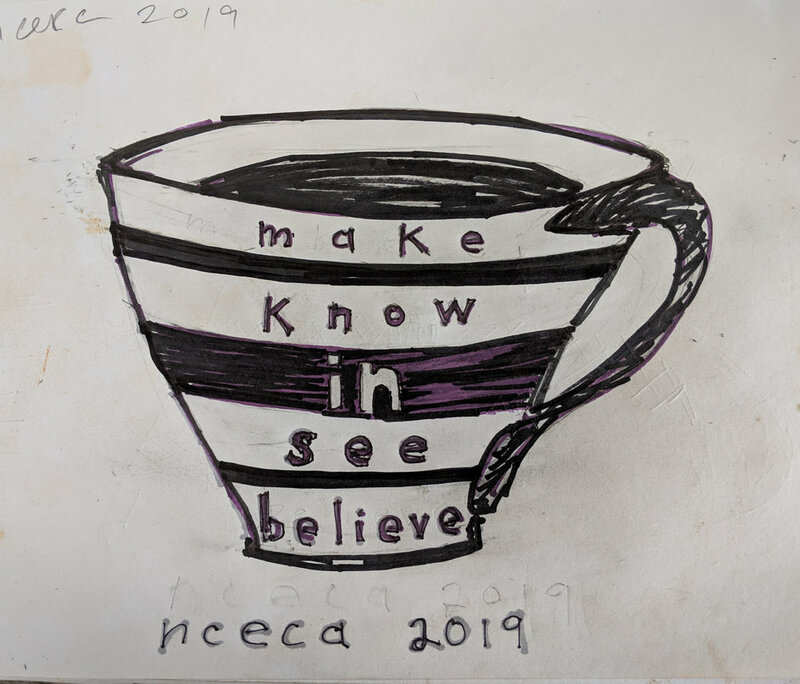 NCECA’s 2019 conference will feature a new project: the Make-In Studio, a pop-up workspace in the heart of the convention center where anyone can come to touch clay, make pots, meet new people, and collaborate, celebrate, and cogitate together. This is an opportunity to get involved hands-on in the conference, side by side with fellow attendees. All are welcome: those just starting out in clay, K-12 teachers, university students and professors, professional and aspirational potters. The room is a drop-in, spontaneous space for expression, sharing, and experimentation. We might be decorating, trimming, and pulling handles on each other’s pots. The studio will be stocked with wheels (including a couple of treadle wheels), tools, slips, and wild North Carolina clay. Logistical support and equipment provided by, Northern Clay Center, my longtime collaborator Sam Taylor, NCECA volunteers, and a team of studio potters who are donating their time will make it all run smoothly. Master clay maker Takuro Shibata will come by to answer questions about the STARworks wild-sourced clays that we’ll be using. Shelves filled with greenware will make an evolving exhibition of our creative activities. Round tables will offer opportunities for discussions and hanging out. Although the focus will be on spontaneous making, two one-hour informal demos are scheduled, each featuring six potters, to provoke and inspire: Pitchers (Thursday, March 28 at 1pm) and Personal and Political Pots (Friday, March 29 at 10:30am). Among our demonstrators will be Michael Kline, Simon Levin, Michael McCarthy, Candice Methe, Mariko Paterson, Sam Taylor, Nate Wilever, and others. As a long-time participant in NCECA conferences, Mark proposed the Make-In Studio to contribute to the many ongoing efforts to make the conference broader and more inclusive. He used to feel an outsider at NCECA, since he doesn’t have a degree in ceramics, a position in academia, or any institutional affiliation. Without the grounding of grad school and job interviews or alumni gatherings, he remembers meanding through the offerings, trying to address the quirky questions that arose within his own life as a young studio potter. At some point he decided to try to engage, to open doors for those who might feel similarly peripheral. Over a couple decades, Mark has contributed programming on issues of personal interest: early American ceramic history, apprenticeship, writing and publishing, and most recently, looking at how the ceramic world is portrayed on screens. The Make-In takes a different tack, building on the response that POW! (Pots on Wheels! ), the collective that he belongs to, has received whenever they’ve come to NCECA. The folks who came by to throw pots on the treadle wheel or decorate greenware or just hang out at the truck-gallery and street-side studio experienced something different from other conference activities. We were makers doing what we like to do: making. And we were meeting new people and enjoying each other at the same time. Mark wanted to expand this casual and spontaneous sense of community by setting up a larger open studio where more folks could simultaneously work with clay during the conference. While there is a clear protocol for proposing a panel, lecture, or exhibition, Mark was unsure of how to put forward this ungainly project. Luckily, he had a conversation about a pop-up studio at the 2018 conference with Sarah Millfelt, executive director of Northern Clay Center and one of the onsite liaisons for the 2019 event. She liked the idea and, crucially, was able through Northern Clay to lend equipment and help with the planning. Josh Green, NCECA’s executive director, agreed to help and he built support for the project in pre-conference board meetings. As the three developed the concept in conversations and emails, Josh suggested the “Make-In” title, building on the ideals of activism and engagement suggested by the Claytopia theme of the conference. If you are at Claytopia please come say hello and get your hands into the clay and join the improvisational three-dimensional conversation.